I have been making my own bread for almost 2 years now. I really enjoy doing it because it’s cheaper, healthier, tastier, and my family loves it. It’s also really easy to make once you get the hang of it. It takes about 2 hours, but most of that time it’s rising.You can take that time to multitask, while filling your home with the aroma of fresh bread. I used to use all whole wheat because that is what my mentor taught me. After not getting it to rise consistently, I decided I could start with a lower standard. I use bread flour with some whole wheat flour. I hope to gradually increase the whole wheat. Here is my current recipe. Mix all the ingredients together, adding last 2 cups of bread flour slowly as I’m more concerned with dough no longer sticking to bowl than exact measurements. Place in greased bowl, cover with towel and let rise in warm place for about an hour or until doubled in size. Punch down and shape into 3 small loaves or 2 bigger loaves. Place in greased loaf pans. Cover and let rise in warm place for 35 minutes. Bake for 18-20 minutes at 350. You will know they’re done when they are lightly browned and hollow sounding when you tap the bottom. Take them out of pans and let cool. Use a pastry brush and brush butter on them. This keeeps the crust soft. As soon as they’re cool put them in a bread bag. This recipe costs $1.06 per loaf saving you at least $1 per loaf. With the satisfaction of making your own fresh, tasty bread without all the mystery ingredients. Warning: If you make this bread your family will like it so much that they have a distaste for store bought bread. Sometimes I use a portion of the dough to make cinnamon rolls, dinner rolls, or pizza crust. Thanks a lot. The drool leaking down my chin is attracting quite a few stares. Ha, ha! I’m glad my bread is drool worthy. that bread looks wonderful! I keep saying I should try making bread again, I didn’t have much luck with wheat bread in the bread machine- maybe I’d have better luck doing it by hand. Thanks, Jenn! You should try and let me know how it turns out. Just wondering how moist the bread is. Lately every recipe I try is so dry and way too heavy. Yours looks sooooo yummy!!! I think it’s fairly moist. I haven’t been able to duplicate bread I buy, but my family seems happy with it. I have tried making whole wheat and it has always been too dense. 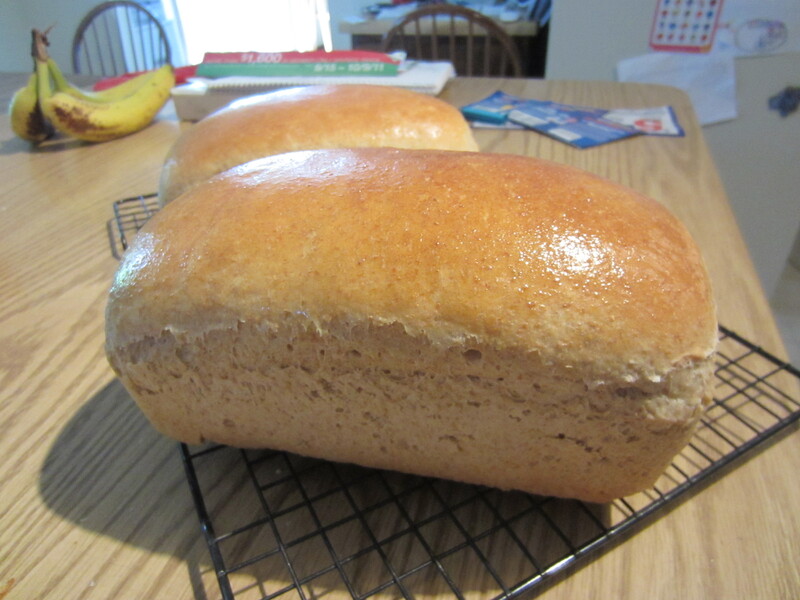 I’m wondering if I were to grind it myself if it would be better, because I have had good homemade whole wheat bread with this recipe that someone else had made.